In your daily life, clothes you wear is very important . People give more attention for fashion. How people dress for certain occasions. Of course the goal is that you are not in wrong costume. 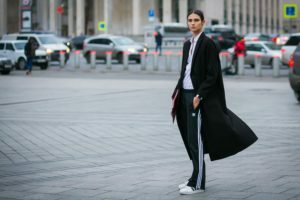 In this following article we will discuss about Fashion rule you should know when live in Russia. Russian is one of the countries whose societies pay more attention for fashion. In the Russian proverb says with good clothes all doors will open. The adage shows how important it is to dress for the Russians. With clothes will give the impression to anyone. In some ways, the way dressing signifies the emotional state and social position. If you are in Russia, here is fashion rule you should know when live in Russia. The rule is wearing dress according to the season. Winter in Russia could reach six months later after autumn. Season sequence in Russia is very pleasant. Peoples are waiting for spring. And when early spring they will change wearing spring clothes. Russians have different clothes for each season. They also prepared different clothes for the transitional season. You have to prepare a waterproof coat on spring. Do not wear long jackets. In St. Petersburg, the weather there is rapidly changing. The people who live there usually prepare several layers of clothing. They wear jackets, cardigans, sweatshirts, and coats. If you live there, you can follow this. If the weather suddenly changes, let put one of your clothes. Some people think, where you go fix your clothes. If you go to the theater do not use long dresses, use diamonds, with famous designer designs. If you want to wear designer famous design wear when you are attending a reception party, because if you use it when going to theater, that’s not the place. Sometime you come to the theater in winter, you can wear high heels, and put your boots on guard. If you wear winter boots will not be appropriate. You can wear appropriate knee-length dresses, wear shoes, and can carry bags. For men you can wear a suit and wear a tie. In some countries, where many companies start up, there are many young people who go to the office. Many of them are wearing jeans when going to the office. They also wear sports shoes. They do because as a young soul expression. Form their freedom to create without limit. And indeed some of them accepted the older generation. But when you are in Russia, understand the Russian dress code. In Russia, a professional office worker is not allowed wearing sports shoes when go to office, even though they are the head of the company. So what clothes fit to wear to the office for the Russians. Wear shirt suits for business to work on, wear formal shoes, wear a tie. Use a comfortable suit, because in working need high mobility. You can wear jeans, but wear jeans only on Friday. Sandals are generally use for relaxation. People wear sandals when at home, when the home environment, when to the beach. To get to the formal places, people tend to avoid using sandals. Even some places prohibit visitors using sandals. This is because of some good considerations for safety, or propriety. What about in Russia, don’t use sandals. Generally, people use sandals when go to the beach, what about Russia. Although Russia has sea, but sea water will be difficult to meet. You get a beach of seawater only in an artificial pond or a sports venue. Although there are beaches in Russia, but the grass cover most, because it is close to the river or lake. So wearing sandals to the beach is not possible. In Russia, wearing sandals is not common, this is because it is a short summer. If you wear slippers In Russia, very inappropriate. When you go to the office, people will assume you have low taste. Weather in Russia is very cold. Please wear a hat to maintain body temperature. In Russia people wear fur hats. You must often see in movies of Russians wearing feathers. This is not unusual. People will be willing to buy the feather hat even if they have some money. This is because the temperature in Russia it could be suddenly changes to -40 C.
In extreme cold weather, walking outside without wearing a hat is particularly risky. People may be expose to dimentia, even death. Children in Russia always wear hats when walking outside. This is to avoid meningitis. Usually the traditional hats in Russia are made of fur. It has protection from cold weather. Uggs boots are shoes made from animal skins. These Uggs can be used for both men and women. People use uggs to keep the feet warm. In different parts of the world people wear uggs. Uggs originated from England and America in the 1970s, so eventually booming around the world. This is because the function of the uggs that can be gained to keep suhi feet in winter. Visiting each others is good things for family and friendship. Sometimes when our colleagues or acquaintances invite them to their homes. How will you dress. In Russia when you visit a private home at the invitation of the host, you can adjust to the norm of cleanliness. Usually Russians wear slippers at home. They are very clean. If you are visiting and you just come, host ask to clean your feet, so please do it. It could be your shoes dirty. This is to ensure that hygiene becomes the main. When in Russia, you could be invited to banya (sauna) or bathhouse, you should attend. This could be said to be a final test for foreigners visiting or living in Russia. Going to banya can be to discuss serious things. For example talking about problems with superiors. So what to wear when banya, you can bring a hat and sandals. You do not have to carry swimsuits, this is a tradition. It would be impolite if you were wearing swimsuits, because they were all naked. What if it was in a public bath, there would be a towel cover for this. If this is an invitation in a private bathhouse, follow what is suggested. And in the private bath you will get 2 towels, one to cover your body, and to lie down in the sauna, another one to dry after bathing. Bringing a backpack is comfortable and practical, you can take it with you when traveling, to the office, or to a tourist attraction. But in Russia, there are some places that should not carry a backpack, one of them when you go to the office. Don’t bring your backpack. In Russia, people wearing backpacks are just tourists and schoolchildren. The person who goes to the office with a backpack will be looked down upon. People who ride public transport and keep carrying bags on their backs will definitely get a spicy comment.So put your bag. There are fashion rules you should know when live in Russia. If you live in Russia you should pay attention to these rules so that you will be rewarded. If you ignore this, you will lose.